Please scroll to video below. Can Virtual Particles Act as Mediators? A. Koekemoer (STScI), R. Windhorst(ASU), Z. Levay (STScI) — Galaxies fill the Hubble Ultra Deep Field 2014. The dimmest galaxies are more than 10 billion times fainter than stars visible to the unaided eye and represent the Universe in the extreme past, a few 100 million years after the Big Bang. 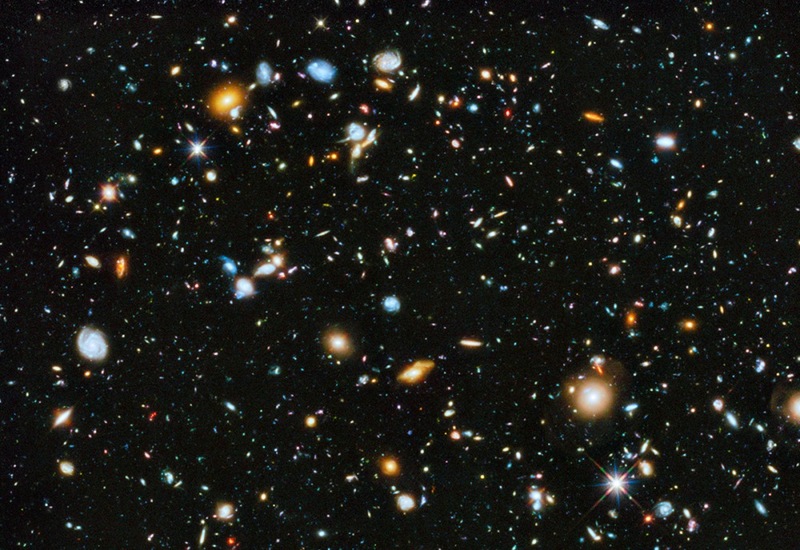 The image itself was made with the significant addition of ultraviolet data to the Hubble Ultra Deep Field, an update of Hubble’s famous most distant gaze toward the southern constellation of Fornax. It now covers the entire range of wavelengths available to Hubble’s cameras, from ultraviolet through visible to near-infrared. Ultraviolet data adds the crucial capability of studying star formation in the Hubble Ultra Deep Field galaxies between 5 and 10 billion light-years distant. A static cosmological metric is derived that accounts for observed cosmic redshift without the requirement for an expanding universe. The metric is interpreted in such a way as to predict a universal potential that accounts the anomalous acceleration of outlying stars of spiral galaxies (the galactic rotation curve), obviating the need for dark matter or modifications to general relativity. One of the most curious properties of elementary particles is their anomalous magnetic moment. This is calculated from what is called the “g-factor”, which is based on the ratio of the magnetic moment due to the spinning particle’s charge, and the angular momentum due to its mass. For classical objects, such as planets, g = 1. But for quantum objects such as electrons, protons, neutrons, muons, mesons and quarks, g can in principle have any value. What this means is, it seems as if the charge of the particle is spinning at a different rate from its mass. For the electron, g is almost exactly 2, naively implying the electron’s charge is rotating twice as fast as its mass. This would seem to mean the electron has internal structure. But accelerator measurements of its cross section indicate it has a radius of zero. Or so they say. But in fact, the Standard Model of particle physics, which comprises a disjointed collection of calculational techniques and equations, does not really offer a picture of the electron’s structure, if it has one, nor a definite way of predicting its properties. Indeed, the g-factor is an ongoing area of research into physics beyond the Standard Model. Several papers in Physical Review D, the preeminent particle physics journal, appear each month on the subject of the g-factor and anomalous magnetic moment, which is usually defined as (g-2)/2. This has become a curious subject because the sum total of human knowledge cannot yet explain it. The g-factor is the most critical parameter distinguishing one particle from another. Some of the g-factors are (approximately) 1 for the photon, 0 for the mesons, 2 for the electron and muon, about 5.6 for the proton and about minus 3.8 for the neutron. Quarks also have g-factors, but these are known only vaguely. Why the g-factor is more critical than say, other distinguishing properties such as charge, spin (quantized angular momentum), and mass, is that the g-factor plays a profound mathematical role at the very foundations of theory. This can be understood as follows. The particles that physicists most often deal with are the photon (a quantum of electromagnetic radiation with spin 1), the meson (particles of charge +,- or 0 and spin 0), the proton (a positively charged particle that occupies the nucleus of the atom and has a spin of 1/2), the electron (a light negatively charged particle that surrounds the nucleus like a cloud and has a spin of 1/2), the neutron (a neutral spin 1/2 particle that also occupies the nuclei of atoms), and the quarks (particles that form the interiors of protons, neutrons and mesons, and have charges of 1/3 or 2/3). Oddly, all of these particles are described by different equations, equations that have very different structures and appearances and seem irreconcilable. These include the Dirac Equation, which is a relativistic generalization of the Schroedinger equation familiar from quantum mechanics and which describes the electron and its antiparticle the positron; the Klein Gordon equation, another completely different relativistic generalization of the Schroedinger equation that applies to spin-0 mesons; and Maxwell’s Equations, which describe the photon. There are others. It turns out, however, that all of these equations can be combined into a single General Particle Equation that takes the g-factor as a parameter. When the g-factor is inserted into the General Particle Equation and the expression simplified by ordinary algebraic methods, the result is either the Dirac Equation, the Klein-Gordon Equation, or Maxwell’s Equations, depending on the value of g. So, for example, if you plug g=2 into the General Particle Equation and simplify, the result is the Dirac Equation, ie the equation for the electron. The interest here is not so much the mathematics, as that the g-factor is so fundamental, it makes a particle what it is: an electron, a photon, a proton, and so on. So even though a photon seems very distinct from an electron, the two are fundamentally the same phenomenon except for their values of g. This very property is at the forefront of particle physics research today. Its nature surpasses the limits of our present understanding, and enormous work is going into its precise calculation and the theories that should, physicists hope, predict its value.